In the morning on July 20th, The Ministry of Education and Training opens teleconference to summarize 2015-2016 school-year, carrying out missions of school-year 2016-2017 of Pre-school Education sector. Ms. Nguyễn Thị Nghĩa – Deputy Minister of the Education and Training chairs the teleconference. School year 2015-2016, scale of pre-school net rose better year on year, presently nationwide has over 14,600 pre-schools (increasing 313 schools). The teleconference approve key orientations, missions for school year 2016-2017 of pre-school educational sector to enhance implementing measures to develop net of school, class, improve education quality to care for children to complete the goal of pre-school education for children at the age of 5. 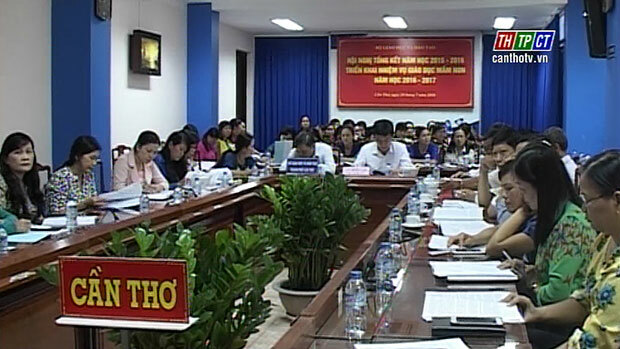 The conference has proposed plan to carry out resolution no.1008 of Prime Minister on approval project “Promoting Vietnamese language for pre-school children, primary school students of ethinic group during 2016-2020 stage, orientation by 2025”.